Saint Fiacre (or Fiachra, Kilkenny, ? – Breuil, France, 670) was a Kilkenny man who came to France in the early seventh century, possibly about 626. In France, the name of Saint Fiacre is sometimes mentioned in the same breath as that of his companion, Saint Kilian, who travelled to France at the same time in response to an invitation from the bishop of Meaux, Saint Faron. While Kilian evangelised the region of Aubigny-en-Artois near Lille, Saint Fiacre stopped at a village called Breuil, in the region of Meaux some 50 kilometres to the east of Paris, where he built a priory and guest house for foreign travellers. He also built a hermitage at some distance from the monastery on the site of a holy well outside the village of Montceaux. 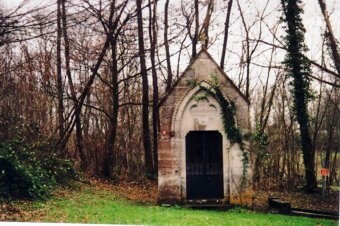 A little oratory—still relatively well kept but hard to find down a muddy country path —was built on the site in 1852. During the Middle Ages, Breuil (now called Saint Fiacre) became a place of pilgrimage. Anne of Austria, for example, periodically made a pilgrimage on foot to Breuil in thanksgiving for Saint Fiacre’s intercession in the recovery of Louis XIII from a serious illness in 1641. In 1683, Louis XIV ,together with his queen, Marie Thérèse, also visited the priory. The story of how his name came to be given to the French word for a light horse-drawn carriage (‘un fiacre’) is actually quite banal. When these vehicles first made their appearance in Paris, it appears that one of the main taxi stands was in front of the Hôtel Saint Fiacre in the rue saint Martin (3rd and 4th arrondissements). Despite his reputation as a healer, Saint Fiacre is better known today as patron saint of gardeners, and he is usually portrayed with a spade in his hand. The legend goes that Saint Fiacre asked the local bishop, Saint Faron, for permission to enlarge the area he could cultivate in order to provide for the numerous pilgrims that passed by his priory. Saint Faron granted Saint Fiacre ownership of all the land he could clear for cultivation in one day. Needless to say, no sooner had Fiacre touched them with his spade than all the trees and weeds in his path fell away. However he did it, Fiacre built up a considerable land bank. Perhaps out of envy, he was accused of sorcery by a native woman called Becnaude. Saddened by the accusation, Fiacre sat down on a millstone that softened under his weight. However, Fiacre was absolved of any wrong-doing and was able to continue his work until his death, traditionally held to be August 30, 670. His brush with Becnaude is advanced as the reason for the legend that he never allowed any woman to enter his hermitage or priory. Down through the years, August 30 has become an excuse for various gardening confraternities in France and Belgium to hold their annual jamboree, often in Saint Fiacre or in the village of the same name in Brittany. 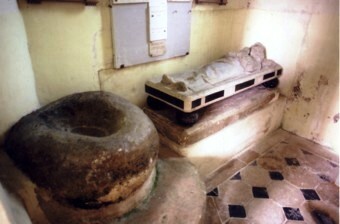 The priory associated with Saint Fiacre and its contents were sold off during the French Revolution, leaving only his tomb and the magical millstone, which are to be found in the village church (built in 1659, open for mass about once a month). However, Saint Fiacre’s remains are not to be found in this tomb, having been removed to Meaux cathedral in 1568, during the Wars of Religion.